KOBE - The government is preparing to test a disaster early warning system for the Asia-Pacific region using one of its quasi-zenith satellites later this year, a Kobe-based international organization said Sunday. Preparations are underway for the first test overseas later this year in India and Papua New Guinea as the nation aims to expand its contribution to other Asian countries’ disaster prevention. The initiative is also intended to mitigate potential impacts of natural disasters on Japanese manufacturers’ production and supply chains, according to the Asian Disaster Reduction Center (ADRC). Prime Minister Shinzo Abe attends a ceremony in Tokyo to mark the launch of Japan's global positioning system satellite Michibiki in November. 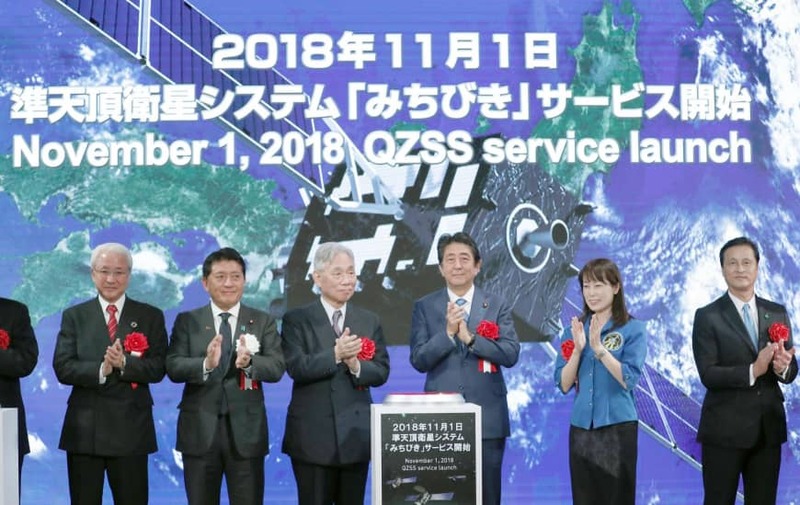 One of Japan’s four Michibiki global positioning system satellites will be used to relay information from institutions monitoring weather conditions, ADRC officials said. The government, working with the ADRC and domestic companies and universities, has developed a receiver to be distributed to local authorities, they said. Experiments have already been conducted within the nation to test reciprocal data transmission. In addition to sending warnings, the system has been used to connect computers at mock evacuation shelters and a disaster response center, the officials said. The system could be particularly effective in encouraging evacuation and managing relief activities in remote areas such as small islands and mountainous regions, they added.